a new attraction not to be missed! Germano's offers an exciting field trip concept that combines hands-on learning with an unforgettable gastronomic experience. Germano's will present a pasta-making demonstration, as we narrate not only the process but also provide a historical and cultural context engaging the participants in a lively discussion that will allow them to make their own connections between what they have learned and will be learning in social studies, math and history. Students will have the opportunity to participate in the cooking process. The presentation will be followed by a lunch in which the students will enjoy the pasta that they have helped to produce. The cost of the presentation and lunch, including pasta, soft drink and ice cream (gelato) is $17.95 per person plus tax and gratuities. The event will run for one hour and is available seven days a week for small or large groups of a minimum of 15 and up to 90 guests. Germano's is handicapped accessible. The pasta demonstration is also ideal for adult tour groups of all ages. Menus can be pre-arranged and start at $17.95 per person and plus beverages, tax and gratuities. Germano's is located in the heart of Little Italy, and is situated just one block south of the Flag House and the Reginald F. Lewis Museum of Maryland African American History and Culture, and east of the Inner Harbor within walking distance of the National Aquarium and the Maryland Science Center. Guests can be dropped off directly in front of the restaurant and on street parking is available. Germano's pasta-making demonstration and lunch has been recognized by the Maryland State Office of Tourism as a "new attraction not to be missed" and appears in the State's Field Trip Guide. We invite you to join us for lunch as our guest any day of the week or on the weekend to plan your next special event with us. Arrivederci! 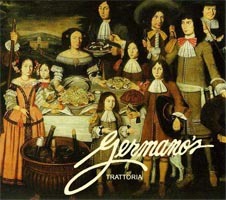 Germano's is an ideal way to celebrate and educate about Columbus Day! Book your Fall field trip reservations now!